“Despite its severity, we believe that the slump in stock prices will prove an intermediate movement and not the precursor of a business depression…” This advice from the Harvard Economic Society on November 2, 1929 illustrates that unbridled optimism in the capital markets was just as dangerous 80 years ago as it is today. Modern financial crises aren’t simply failures of regulatory oversight or inherent structural weakness. They’re a combination of the cyclicality of human behavior, the dangers of unbridled leverage, increased speculation by unsophisticated investors, and our complete lack of financial memory beyond 20 or 30 years. In recent weeks, our mounting economic woes have sent financial experts, journalists, and average citizens running to the history books in search of clues about the causes and potential fixes for our present mess. Many are seeing disturbing parallels between today’s state of affairs and the period that preceded the Great Depression of the 1930s. Not surprisingly, the onset of the Great Depression provoked a similar spate of economic soul searching. A series of Atlantic articles published in the aftermath of the 1929 stock market crash captures that era’s collective grappling with the situation—and reflects a broad range of thinking on the future of our economy, politics, and society. The unit bank was well suited to financing the small, independent businesses that had dominated the American economic landscape throughout the 19th Century. But the trend toward centralization of the economy, set in motion during the Industrial Revolution, called for banks with far greater resources. The independent retail stores have given way to chain stores; electricity, gas, water, and transportation are now supplied by public-utility corporations that are state-wide or regional in character. Local industries have merged with larger corporations. The financing of these enterprises, once a profitable outlet for investment of the funds of the local banks, is now being done by central banking institutions, equipped to render adequate service to the larger business units. Ostrolenk emphasized that this restructuring of the national banking system “has sprung up in accordance with economic need.” The chain bank, he argued, was “an essential substitution for branch banking.” Still, as with any economic evolution, changes in the banking system had dire consequences for those left behind. “Within eight years,” Ostrolenk reported, “almost one sixth of the United States banks have been suspended with losses to the depositors.” Not surprisingly, the vast majority of these had been small unit banks. When a man wishes to borrow…his credit is appraised and a loan is made proportionate to his credit standing. Banks rarely, if ever, make loans to people with whose affairs they are not reasonably familiar. In the case of debit balances, however, stockbrokers extended credit on neither ground. Instead, the ability of the borrowers to pay back the loan depended on “the general level of stock prices.” But those prices, Smith pointed out, were “a function of the volume of credit so granted.” The flaws in this system soon became tragically apparent, ruining many unwitting investors. The community depends upon the fraternity of bankers to see to it that the credit of the community is not squandered, that it is sound in character and can be depended upon…No Federal Reserve or other system can be devised to protect the quality of credit if bankers throughout the country do not apply sound judgment in the making of each loan. In an April 1931 Atlantic piece “Whirlwinds of Speculation,” Samuel Spring blamed the collapse on more structural causes, showing how the promise of fantastical profits—proving to be “more potent than experience or reason”—had driven speculative booms and busts in three distinct sectors of the economy. The pouring forth of this great torrent of new units of speculation results in the inevitable consequences dictated by the law of supply and demand … a consequent collapse due to the excess of sellers over buyers. In this final part of the cycle, according to Spring, speculation attains its most delirious heights—and inflicts its most lasting damage. “The wilder the outpouring of new units of speculation, the more acute and distressing the consequent panic,” he argued. Fraud and coercion the State can restrain; but, unless we wish to go the road toward communism, the State must leave every buyer and every seller free to act as wisely or as foolishly as his intellectual and emotional capacities dictate. Other Atlantic contributors, however, advocated an expanded role for the federal government so as to mitigate the social consequences of the economic downturn. 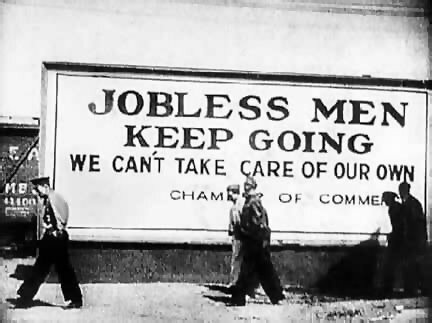 Though labor advocates had been pushing for years for such protections as unemployment benefits and health insurance, the intense suffering that took place during the Great Depression gave their cause greater urgency. In May 1930, The Atlantic published an essay by Alice Hamilton (the first female professor at Harvard Medical School and the founder of the industrial toxicology field), making the case for government-funded pensions for the elderly poor. In “State Pensions or Charity?” Hamilton criticized the “characteristically American method of dealing with the problems of poverty,” which was then a patchwork of private organizations. She argued instead for state-funded pensions, which she contended would be more reliable and would lack the stigma of charity. This year, if ever, it behooves us to think soberly of the need of giving some form of security to those upon whom the fluctuations of business throw the heaviest burdens. These are men and women who have no control over discount rates, or credit, or the manipulation of bull markets and bear markets, yet they are the first victims of the battles fought in those high and mysterious regions. … It is time for us to devise ways of meeting the inevitable disaster of old age and the almost equally inevitable disasters of sickness and unemployment, and these must be ways that will not fail when the stock market breaks or a new machine is invented, that will function in the lean years as in the fat years, and that can be accepted without loss of self-respect. Another Atlantic contributor, Sidney Hillman (founding president of the Amalgamated Clothing Workers of America and a prominent labor advocate), likewise focused on the importance of safeguarding citizen welfare. In his November 1931 essay, “Unemployment Reserves,” he argued for an expanded system of unemployment benefits, and drew on his own experience with the men’s clothing industry as a case study to illustrate how such a system could work. In Chicago in 1923, he explained, the clothing manufacturers had agreed to implement an unemployment reserves system into which workers and their employers each contributed 1.5 percent of their weekly payroll. Anyone who lost their jobs through no fault of their own would then be able to receive 30 percent of their full-time earnings for up to seven weeks. By January 1930, at the beginning of the severe part of the present depression, there would have been built up a public reserve for the mitigation of the distress of millions of unemployed Americans. … Millions of wage-earning Americans would have been spared the humiliation of cooling their heels in charity offices, of begging in the streets, of marking time in bread lines, and, after all the torture and humiliation, of being for the most part starved, cold, and bare. Many government entitlement programs still in place today have their roots in the Great Depression. In a February 1934 article, “The Roosevelt Experiment,” the British economist Harold J. Laski defended President Franklin D. Roosevelt and the interventionist reforms he initiated in the first year of his presidency. Laski dismissed critics who characterized Roosevelt’s policies as radical departures from the laissez faire tradition of American political economy. He saw the Securities Act of 1933 as legislation simply mandating “the most elementary precautions required by the investor under modern conditions,” and argued that the National Recovery Act “merely gives effect to ideas which have been the commonplace of economic discussion these thirty years.” He also defended the need for public works projects and credit relief for those with mortgages. The failure of Mr. Roosevelt means the end of political democracy in America, for the simple reason that it will prove itself thereby incapable of adapting to its purposes the institutions of its economic life. … But if he succeeds, he will write a new page in the history of the world. For, having saved America by his energy, he will, as one trusts, save Europe by his supreme example. We know with the clarity of hindsight that FDR did succeed in building support for his policies and his own reelection, though it took the manufacturing boom of World War II to truly rescue the American economy (and the Marshall Plan to save Europe’s). But Laski certainly recognized the sweeping scope of Roosevelt’s reforms. The president’s intention, he noted, was not only to dissipate the effects of the Depression, “but also to lay the foundations of a new social order from which, so far as human prescience can avail, such disasters have been banished.” If only Roosevelt had succeeded. Tagged crisis, depression, economics, finance, history, society. Bookmark the permalink. Can you tell me where you got that great picture of men walking in front of “jobless men keep going? I am working on a documentary and would love to get a hold of a good resolution copy. Is High Technology and More Education destroying us? When Franklin Roosevelt became President he had a large labor force of farmes and unskilled worker that he knew he could get back to work with WPA and other programs. Today we have probably the world’s most educated unemployment line. Franklin Roosevelt was able to close the banks for a few days and when they reopened the FDIC had been born. Oh in no way am I criticizing Technology and Education I am just thinking that we are where we are today because the Tusted people in Certain placed did the same things over the past ten years as was done before the Deprssion in 1929. The major difference today is most people today are not laborers and farmers. We have become an educated society where the same programs of the thirties would not work today. There is no government controlled program that can put millions of highly skilled and trained people back to work right away. Neither Technology or Education got us to where we are today. It was uncontrolled programs, planning and selfish people that got us here.